Virtual GameBoy v5.5 is released. Virtual GameBoy is a program that emulates the Nintendo GameBoy handheld on your computer. It runs GameBoy, Super GameBoy, and GameBoy Color games on PCs, Macs, PocketPCs, Unix boxes, etc. VGB also helps debugging GameBoy software without using a costly development system. * Added ability to play GBC games in GBA "backward compatibility mode". 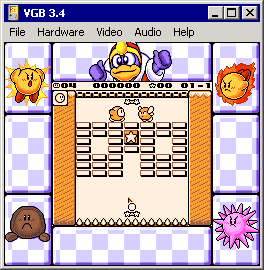 * Use -gba in VGB-Unix to enable GBA compatibility mode. * Use "Hardware | GameBoy Model | GameBoy Advance" in VGB-Windows. * Made replay code always return "replay-ended" when replay ended.